I never managed to watch Taboo during its first run in the West End but I have adored the DVD of this show ever since I first watched it years ago. So obviously I couldn’t miss out on watching this new production which is currently running at Brixton Clubhouse. If I had to describe Taboo to anyone who knew nothing about the show I would probably compare it to the Rocky Horror Show but with more depth to it. It’s colourful, it’s wild, it’s extravagant, it’s full of politically incorrect jokes – in short, it’s one of those shows that screams into your face: Look at me!!! But don’t let yourself be put of by this description. Beneath all the loud beats of the music, the over the top costumes and the almost mask-like make-up lies a story of love, friendship, finding out who you are and staying true to yourself. The show is staged in a club with a catwalk-like stage that runs through the audience. 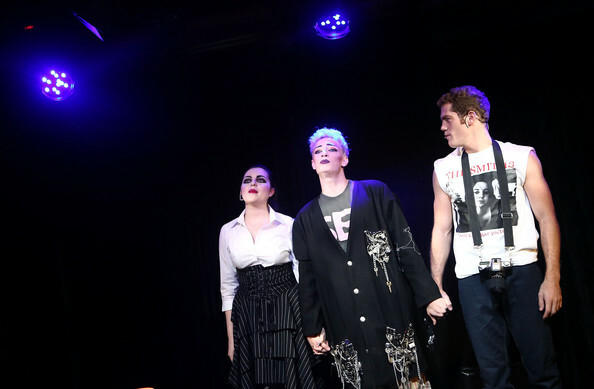 The cast performs both on stage as well as in the bar area and even right in the middle of the audience. You definitely can’t get closer to the action than in this show. For someone who doesn’t enjoy audience participation: Be warned, you might have a problem with this show. Because even if you try it is almost impossible to escape he witty remarks of Paul Baker who reprises his West End role as Philip Sallon. Paul is without a doubt the star of this show – no matter how rude his jokes may be he delivers them with a twinkle in his eye. He is witty and funny and you can’t help but be fascinated by this strangely dressed, middle-aged “landlady” that is Philip Sallon. 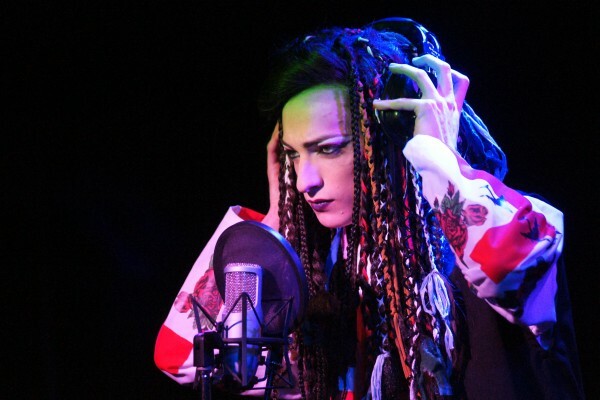 Matthew Rowland takes on the part of Boy George and does a fantastic job portraying such a hugely famous and without a doubt rather difficult personality. His “Stranger in this world” was deeply moving and really made me feel for this young boy who is on the edge of getting lost in all the glitz and glamour he is surrounding himself with. Another stand out performance comes from Niamh Perry as Kim, the female lead of the show. I admit I was never a fan of her performance in Love Never Dies. However, in Taboo she blew me away with her amazing vocals and her defined portrait of the rebellious Kim who is after all still just a girl who wants someone to love her and take care of her. 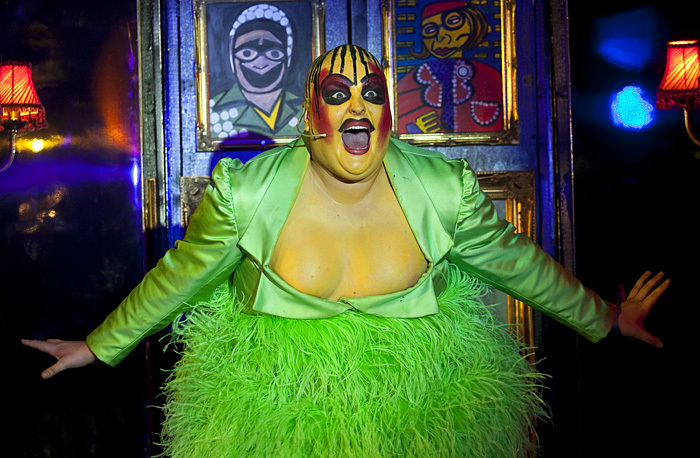 I enjoyed Sam Buttery’s performance as Leigh Bowery. He definitely owns the stage whenever he sets foot on it – which is partly due to his almost outrageous costumes (or the lack of them – I won’t go into detail here, you’ll have to see for yourself). Having seen Boy George himself play the part on the DVD I though Sam’s performance wasn’t quite as charismatic but that is a really minor criticism. The rest of the cast does a brilliant job. The great thing about this show is that it gives basically everyone in the cast a moment or two to take the spotlight. 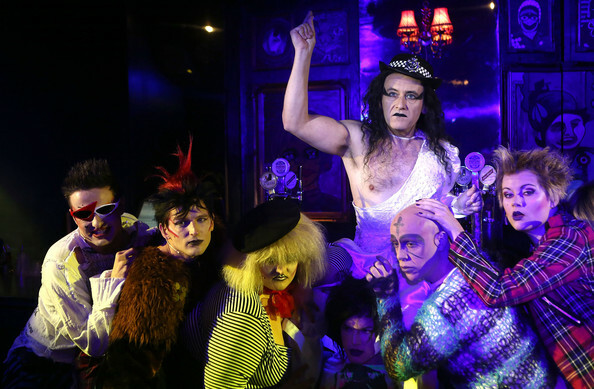 And in this intimate venue the audience really gets drawn into the story by the cast and goes on a journey through London’s club scene in the 1980s. To sum it up, this show is different and it requires an open mind to be enjoyed in full. But if you allow yourself to just let go and dive into the world of Taboo you will experience a story about love against all rules, being different and wanting to be liked and admired (or maybe just accepted?). Taboo is playing at the Brixton Clubhouse until 23rd December 2012. For more info and to book tickets go to http://www.brixtonclubhouse.com/.